I am unsure of the nuances and depth of chicken thought and feelings. I know they experience emotions, I have seen it. This is irrefutable to me. It is simple fact made complex by people. I have been asked if chickens feel. Emotions. Thoughts. Sometimes I am told whether they do or not (and when I "am" being told, it’s to let me know they don’t). I am unsure of the nuances and depth of chicken thought and feelings. I know they experience emotions, I have seen it. This is irrefutable to me. It is simple fact made complex by people. Today I watched two animals bond. It was a simple act of comfort being offered and accepted. I cannot describe it in any other way. There is a hen who has a bad eye. The eye, it squints. There is perhaps difficulty seeing. When she cannot see, she becomes uncomfortable in her skin. You can see it by the way she turns in circles, keeping her good eye to the world. When the good eye is turned the wrong way, towards the center of the circle, her world winnows down and she paces, circles, paces, circles. You want to reach out and help her but know quickly how flighty she is, how afraid of humans a hen from a battery cage operation becomes. Her good eye suddenly catches sight of white, feather, fluff. The soft down of another bird. Carefully, she investigates. Sometimes those she seeks to touch retaliate with pecks or move away. Sometimes chickens are moody and cruel. She stands in front of the other bird, then sidles to the side – I am no threat, she says, remember me? The other bird appears to do so. She is an ex-battery cage hen too. Under the misters, they touch. 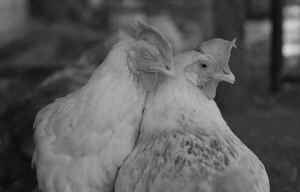 Squinty-eyed hen circles the seeing hen, leaning into her, deeply, superficially, but always touching. She drapes a head over her companion’s back. She touches the comb of her friend, gently. At one point, she falls deeply into the contours of the hen’s body, filling the small “s”. A perfect connection. But this photo is my favorite moment. It is the second the hen with the squinty eye can totally relax it. She does not struggle to keep her bad eye open. She closes it. She has a friend.